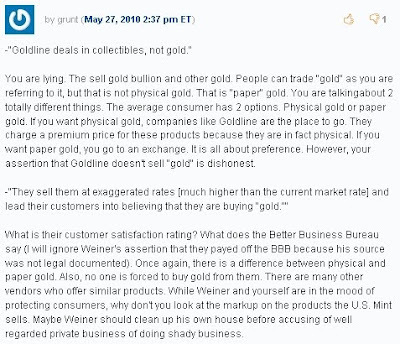 I was reading about Glenn Beck's association with Goldline and the involvement of Rep. Anthony Weiner when I noticed a comment left by a supporter of Beck that illustrates just why any argument against the popular host will result in failure, at least in the eyes of his most ardent fans. 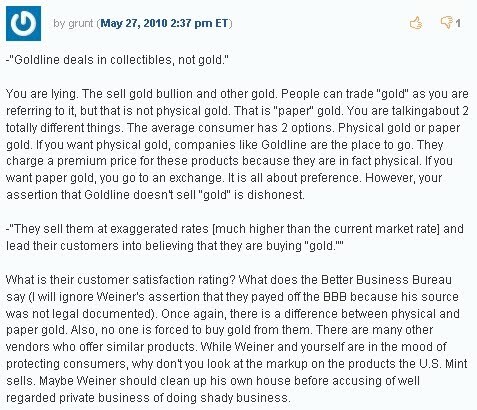 What caught my eye was grunt's answer to the second statement, in which he questions the customer satisfaction ratings and the opinions of the Better Business Bureau as proof that Goldline is a legitamite operation while attacking Weiner's assertions because his sources "was not legal documented." Grammar aside, this comment seems completely hypocritical considering every Glenn Beck assertion is based on nameless sources. He even requested on his program anonymous sources to step forward. How am I to believe anything Beck says when the best he can do is discuss a hundred year assault on American principles by some secrative progressive conspiracy that conveniently includes everybody at political odds with the pundit as well as those who cricize him - just take into consideration Beck's throwing Rev. Jim Wallis in his rotation of subversives after Wallis commented on Beck's statements regarding religion and "social justice."